Tired of concealers that crease, rub off or appear cakey over the course of the day? 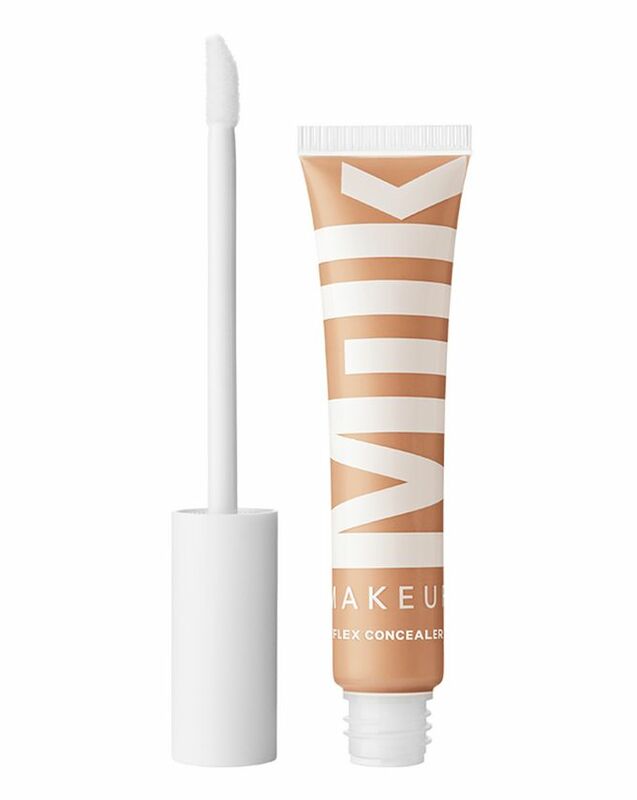 Milk Makeup’s medium-to-full coverage Flex Concealer is a game-changer, covering anything from scarring and pimples to under-eye circles, all without cracking or creasing. How does it achieve such high levels of awesomeness? The secret lies in elastic marshmallow root powder and teeny bendable spheres (science is a wonderful thing), which bend with the skin as opposed to cracking or shifting. Unlike most concealers, it is also spiked with blue lotus to hydrate dry areas, plus chamomile to calm redness and irritation. Milk Makeup’s ground-breaking Flex Concealer combines hi-tech and natural ingredients for a flawless no-budge finish. Available in 16 shades to suit a range of skin tones, the medium-to-full coverage formula will cover anything from blemishes to scarring. Wanna hide signs of the night before? This masterpiece of a product will disguise revealing dark circles, so you can fool your friends into thinking you got your full eight hours. You can be assured of no caking or creasing throughout the day – or night – thanks to a clever combo of elastic marshmallow root powder and minuscule bendable spheres. These flexible ingredients allow the product to move as your face does for a no-crease second-skin finish. To top it all off, Flex Concealer is infused with hydrating blue lotus and soothing camomile, so you can cover irritation or blemishes and cover them at the same time. Dot under the eyes, over blemishes or imperfections and blend with your fingertips, a brush or sponge. Not particularly a fan of the texture of this product, and found it didn’t blend in with my foundation very well. However this worked wonders on my eyelids for eyeshadow and worked better then my normal concealer, made colours really stay and pop, as well as working really well for cut and creases as the product kinda stays where it is applied. Probably will buy again as a eyeshadow primer/concealer rather than for actual concealer. This is a great concealer, really good coverage and soft in texture. However, the tube it comes in is poorly made, every time i open to use, excess product escapes as the 'stopper' falls off when it is opened. I sent my first one back and received a new one which does exactly the same. New packaging would make this a 5 star review. Have wanted to try this product for ages! To begin with i thought I might have ordered the wrong shade as it seemed a bit too light, but after trying it a few times I was pleased. Its a bit pricey for a concealer but it is a good product and I didnt find it too drying. I love this product. It’s one of the best I’ve ever used. But the tube leaks horrendously. Read some great reviews on this product but unfortunately it doesn’t do as it says. Really creased around my eyes making my fine lines really stand out and the shade was about 2 shades darker than what I thought it would be. Absolutely gutted. I tried this at the launch party then bought it. It’s been almost a week. This formula is not as wet as the TF and does not dry down as quickly as Nars or Tart. I do love this formula. The wand is also a good size for under-eye area. Brilliant! Not cakey, feels like you’re not wearing it it’s very light. The wand is a great idea and makes it less messy to apply. Not full coverage but good medium coverage and two layers should cover bad spots. Very lightweight, blends well and does not break me out. Good all round concealer. I have dry skin and I find this just a little bit heavy on my skin. It has a nice medium coverage (it does not fully cover blemishes). It creases slightly around smile lines and under the eyes. I have my doubts that this packaging will be practical once the concealer starts to empty. Nevertheless, I think this is a decent concealer. It is easy to apply, lasts really well on me and does not change the colour or break me out. I will certainly use it up but the NARS soft matte is just a tad more natural and easier to apply.